It is essential to be aware, the prelate added, that "our media is directed not just to Catholics, but to all men. They are not media for Catholics, but rather are the presence of a Catholic reality that is open to man, all men." He offered the example of Catholic newspapers or radio. "It is undeniable," Archbishop Celli said, "that they don't exist only for -- or are directed only to -- people who already belong to the Church, rather they should also give careful attention to what exists in the soul of man, in his heart, where sometimes there can be distance from God, or many times, a deep nostalgia for God." Our media, he summarized, "should search, and help in the search. Our media should not become, allow me to say it this way, instruments of a religious or cultural fundamentalism." 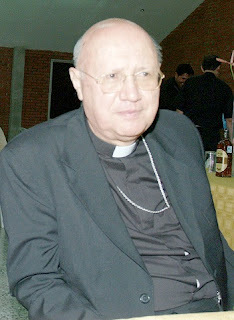 Archbishop Celli contended that Catholic media should be at the service of the culture. He explained that media should know how to enter "in this search that man embarks upon every day […] as instruments of this 'diaconia' of the culture […] instruments that teach what it means to dialogue, to be men who respect others' positions, who know how to welcome, who know how to understand." "I emphasize it again," Archbishop Celli stated, "We are not seeking a religious fundamentalism, because sometimes this is the risk. And the Church itself is not that; it is not a 'tower of marble'" that proudly stands "in its possession of the truth, but rather a Church that knows how to welcome, understand, dialogue, respect." Some news sources such as the independent UCA News and Catholic News Service (owned by the United States Conference of Catholic Bishops but operating with editorial independence) hold to professional standards of timeliness, attribution, accuracy, balance and verification. There are also news "retailers" (newspapers, blogs, etc.) that hold themselves to the same standards. However, there has been a proliferation of Catholic "news sources" that do not follow those examples. Bias, distortion, refusal to cover the "bad news," lack of balance, deference to officials and failure to verify are common. Catholic media outlets with editorial freedom to accurately present the face of the Church to its audience rather than being mouthpieces for "Church authorities" -- Religious superiors, pastors, bishops, curial officials and popes -- are few. One diocesan newspaper I saw had 11 pictures of the bishop on its first nine pages. It was clearly not a paper that intended to present the life of the Church in all its variety. Why does it matter if the Church does not have a media voice like that which should prevail in the secular world? One reason is that if the Church is incapable or unwilling to report on its life and activities with transparency, others will step in. However, leaving honest reporting of the Church to outside media leaves us open to misunderstanding and even sensationalism. It is hard to refute charges of "cover-up" when, in fact, Catholic journalism either consciously or inadvertently fails to present a full picture of the Church, "warts and all." We need a trustworthy professional Catholic journalism in order to present the true face of the Church to the world and each other. Being trustworthy means having a commitment to the truth rather than to looking good. If Church media are seen as PR rather than journalism, others will not believe us when we actually have good news -- as well as the Good News -- to convey, nor will they look to us for information and insight.